Boreham Wood beat his AFC Fylde side in the play-offs last season and manager Dave Challinor expects Saturday’s visitors to Mill Farm to challenge for promotion again. 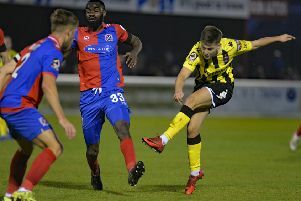 And the Coasters boss urged his sixth-placed side to be more ruthless as they bid to extend their seven-point advantage over Luke Garrard’s team. Fylde are yet to beat the Hertfordshire side, who drew 2-2 at Mill Farm last season and won the home fixture 1-0 before edging that play-off semi-final 2-1 at Meadow Park. He said: “It will be tough. We played each other numerous times last year and they were all close, fiercely-contested games. I expect this to be no different. “They started the season quite well and I expect them to be in and around the play-off positions. “I know Luke Garrard well. They are an organised team who will be difficult to break down. “They are a big, physical side who will work their socks off. “Every game is a different challenge and we will have to look at little things but we will concentrate on us. Challinor says it is unusual for him to takes positives from defeats but he believes there were plenty in Fylde’s last two games. He continues to highlight a refereeing decision that went against his side in the Orient game, saying he has received an apology for the missed push on defender Jordan Tunnicliffe which preceded Macauley Bonne’s opening goal. Challinor says the Dagenham defeat was down to a lack of clinicality, something he wants his side to address tomorrow. He told The Gazette: “You look back at the away games we have won and we have played a lot worse than we did last weekend. “Again we were punished for two mistakes. They maybe had three shots all game and scored two. “They will feel they have been ruthless and took their chances. At the other end we have not taken ours. “We started the game really positively. You can point your finger at us and say we should stick away the chances we created but we came up against a goalkeeper (Elliot Justham) who had an inspired day and made save after save. “We did not lose due to a poor performance. That has been in the case in the last two games. “We have been punished for the sort of mistakes we made earlier in the season but managed to get away with. “Earlier in the season we were drawing lots of games 0-0 and having a couple of decent opportunities. But in the last two games I don’t think it would have been a disservice if we had scored three or four. Loads of positives. “In terms of our overall performance on the ball we have done really well at times and managed to play through teams – it is just that last little bit.